Copies of the Nappa leather bound limited edition of G.L. Watson – The Art and Science of Yacht Design by Martin Black have arrived in Cowes: now in stock at K1Britannia, 16a High Street. As Irish and Scottish sailing teams based at Cowes, Isle of Wight, this week attempt to carry off the Royal Ocean Racing Club’s prestigious Brewin Dolphin Commodores’ Cup, little do they know, we imagine, what an important role some of their countrymen played in shaping sailing and yacht racing as we know it today. Just arrived at K1Britannia, on Cowes High Street, are copies of the Nappa leather bound limited edition of G.L. 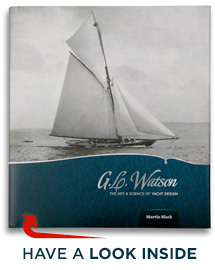 Watson – The Art and Science of Yacht Design, Martin Black’s award-winning, intensely researched and beautifully illustrated biography of Scotsman, G.L. Watson, designer of the royal racing yacht Britannia (1893-1936), as well as four America’s Cup challengers and countless racing and cruising yachts – and steam yachts, the superyachts of their time. The special edition of this unique collector’s piece – an expertly crafted yachting book like no other – is limited to 40 copies. K1Britannia also hold stock of the regular edition, together with Hal Sisk’s fascinating examination of the previously little-known crucial role played by 19th Century Irish sailors in the codification of the sport of sailing: Dublin Bay – The Cradle of Yacht Racing. It seems strange to be thinking about Christmas in the heat of July… but you know what we mean: these books make wonderful gifts. It’s a busy week in Cowes, but when is it not. At the same time as a multinational fleet of cutting-edge modern racing yachts contests the Brewin Dolphin Commodores’ Cup, the Royal London Yacht Club is running its popular Charles Stanley Cowes Classics Week, a celebration of the variety of yachts now quite sensibly considered classic – such as the early 60s “classic plastic” Nicholson 36s, an eclectic group of classic one design dayboat classes – including the Loch Longs, which hail from the Firth of Clyde but also sail at Aldeburgh, Suffolk – and, of course, the Old Gaffers. “Ireland’s three boat team, comprising Anthony O’Leary’s Ker 39 Antix, Marc Glimcher’s Ker 40 Catapult and Michael Boyd and Niall Dowling’s Grand Soleil 43 Quokka 8, today scored the most comprehensive victory in the 22 year history of the Commodores’ Cup.” Read more at Yachts & Yachting. And Team Scotland did much better than their 6th place overall suggests, finishing only 15.5 points off 2nd overall. This entry was posted in America's Cup, Big Class, book, Britannia, Clyde yachting, Clydebuilt, Dublin Bay - The Cradle of Yacht Racing, Firth of Clyde, G.L. Watson, G.L. Watson & Co., gift, Hal Sisk, Irish yachting, leather-bound, limited edition, Martin Black, object of desire, RNLI, shipbuilding, shipyards, Steam Yacht, tank testing, yacht clubs, yacht design, yacht designer, yacht racing, yachting history and tagged Aldeburgh, Brewin Dolphin, Christmas 2014, Commodores' Cup, Dublin Bay, gift, Hal Sisk, Irish Cruiser Racing, K1Britannia, Loch Long One Design, RORC, Royal Ocean Racing Club, Sir Thomas Lipton, team Scotland CC, Team Scotland Commdores Cup 2014, The Racing Rules of Sailing. Bookmark the permalink.